GAAM Aerotropolis Update No. 3 has been published. It looks at 43 aerotropolis developments, in 29 countries all regions of the world. Major aerotropolis projects are among the largest megaprojects that are planned and under construction. Aerotropolis Update highlights serious concerns including loss of large areas of farmland and wildlife habitat, displacement of rural communities and serious instances of land acquisition injustice. Many aerotropolis receive preferential government treatment, in particular tax breaks, and overlap with special economic zones. Maps created for GAAM show the proposed 80 square kilometre land area for Nijgadh airport and aerotropolis in Nepal, the 95 square kilometre China-Belarus Industrial Park next to Minsk Airport and farmland earmarked for the proposed Airport City Gatwick business park. The Update covers just a fraction of what is happening with airport-centric development worldwide. Material is already being compiled for Update No. 4. 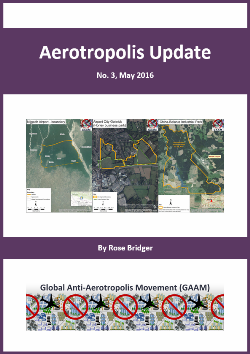 Issues 1 and 2 are available on the GAAM Aerotropolis Update page.